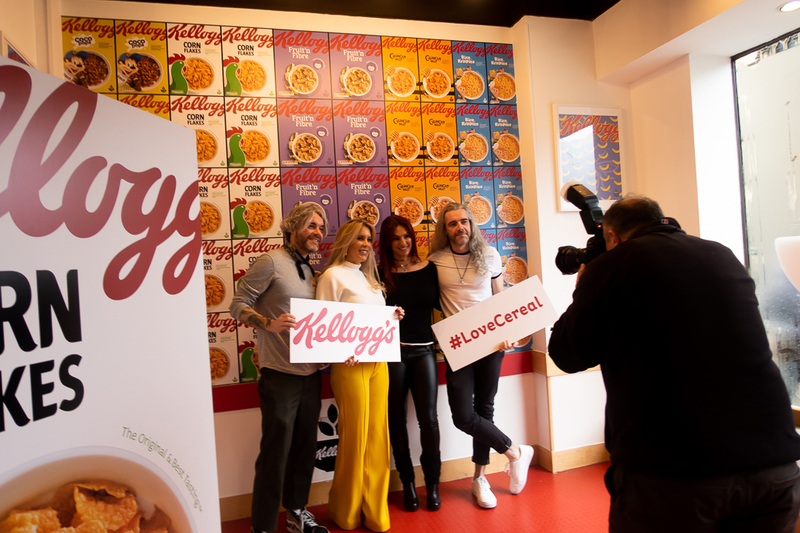 In celebration of National Cereal Day, Kellogg’s have teamed up with Londons Cereal Killer Cafe. 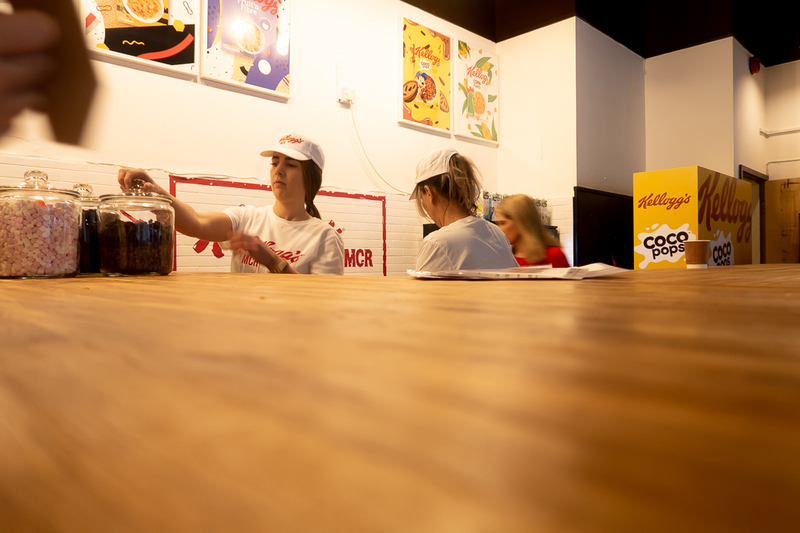 Opening their first EVER pop-up cafe in the heart of Manchester. 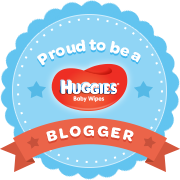 Which for those who don’t already know, is where Kellogs are based. 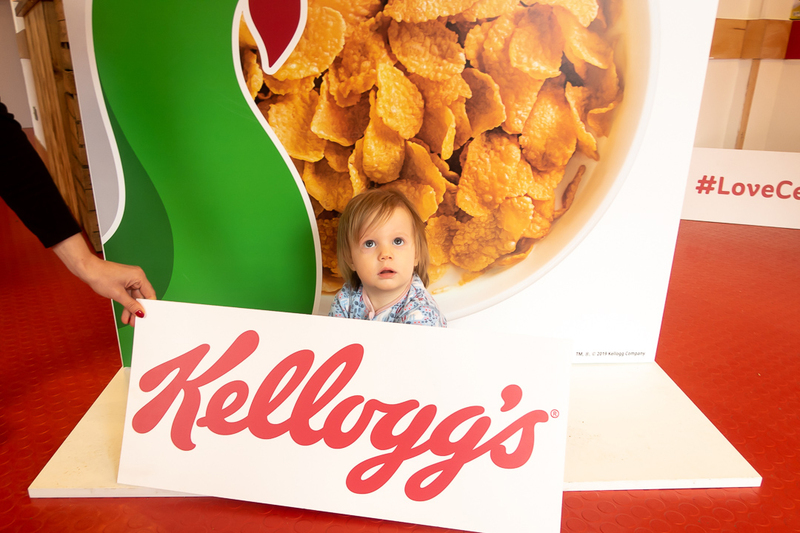 Yes, your favourite cereals are made right here in the north! 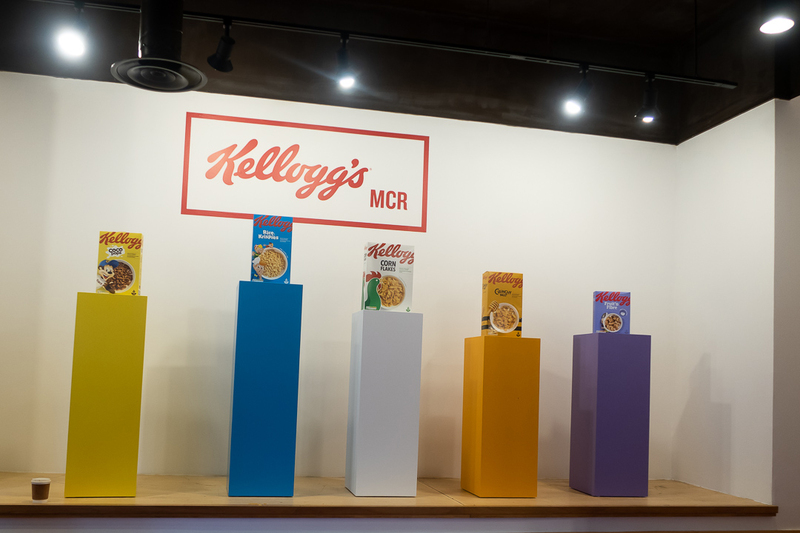 We popped over to the opening of the Pop-Up to see what Kellogg’s had in store for everyone. With an open bar serving up everyone’s favourite breakfast, and the best barista Mocha I’ve had in a long time, we were spoilt. Catering for everyone from allergies, intolerances or lifestyle nobody went hungry. 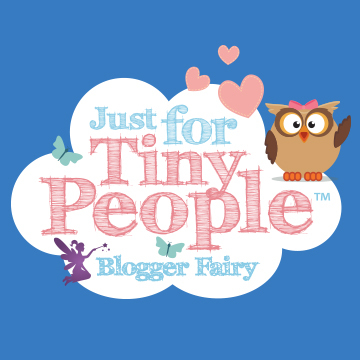 I was amazed to find that our favourite CoCo pops are dairy free. So with a little Soy milk, Harriet was able to enjoy some too. 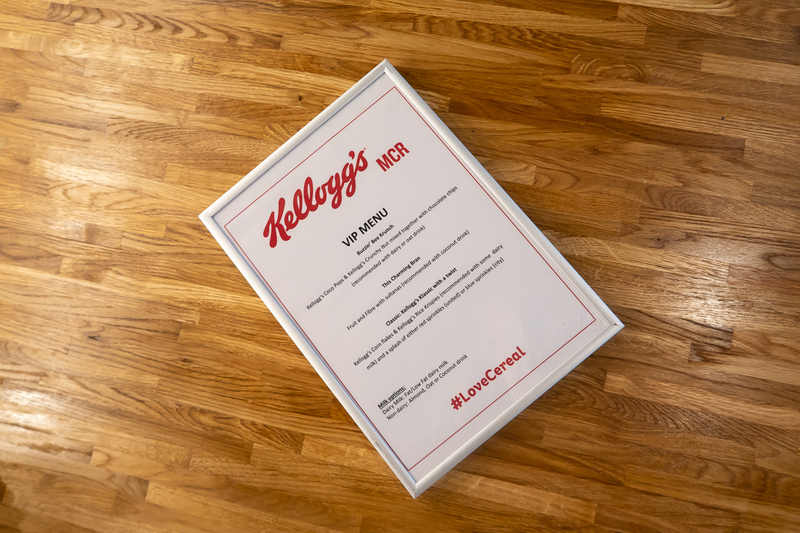 We were given the VIP cereal treatment with choices from a special menu and concoctions I would never have thought of making myself! To kick start my morning I had the Buzzin Bee Krunch, a mixture of Crunchy Nut Cornflakes, Coco Pops, and chocolate chips. Yes, chocolate chips. On cereal! I was apprehensive, it reminded me of when you’re 6 and mix a bit from every box. But to my delight it was delicious. So much so I had a second bowl. Oops. We were also treated to Kellogs MCR goody bag. 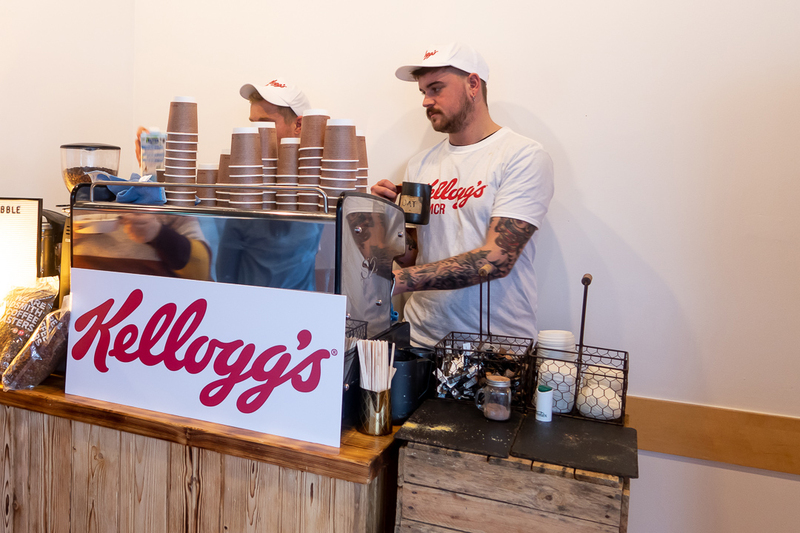 Containing a hat and tee, so now we can always be on trend and prepared for if we ever want to join the Kellogg’s crew! There were also ginormous family size boxes of Crunchy Nut and Cornflakes to take away. 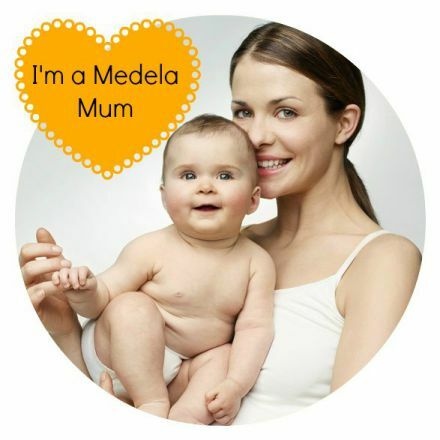 However, with a baby in tow, I was unable to carry it. Good job I filled up on cereal whilst there. After taking some pictures, seeing the Cereal Killers, and CoCo the monkey, we grabbed a Mocha to go and headed back into the cold, with our bellies full of cereal. Not your average morning in the city and well worth the journey. Taylor has since declared that he’s getting a box of CoCo Pops with his face and name on because Ryan Toy review had cereal with his face on… Which I’m pretty sure his parents made. Keep an eye out for some DIY cereal boxes on my Insta Feed – Taylor Pops anyone? Maybe that should be a thing, cereal with your face on? 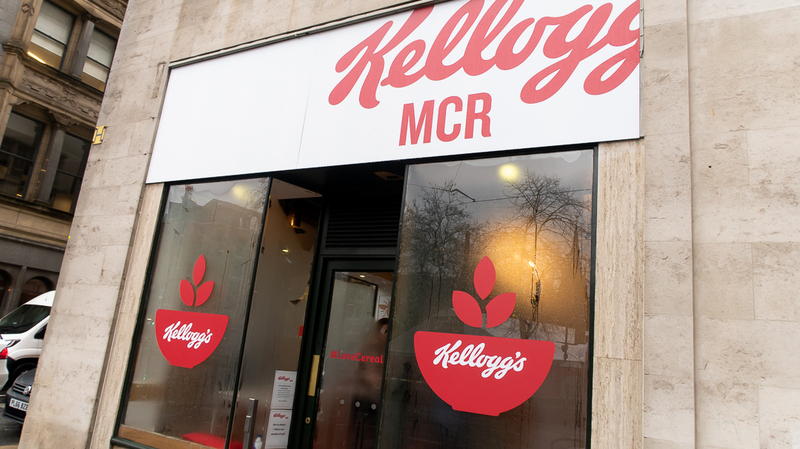 The Cafe is open to the public over the next 4 days at 23a Princess Street Manchester – Look out for the big Kellogg’s MCR sign and you can’t go wrong! 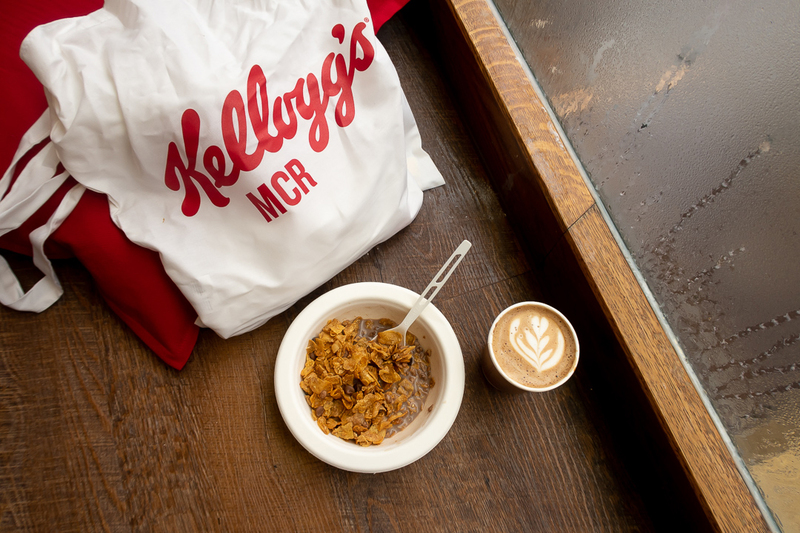 Head on down, get yourself some cereal, grab a coffee and bask in the glory that is Kellogg’s.